DM - Gastroenterology, MD - Paediatrics, M.B.B.S. Dr. Arvind Sahni, MBBS, MD (Paediatrics), DM (Gastroenterology), is the Director of the Gastroenterology Department, at Fortis Hospital, Mohali and is heading Fortis Healthcare City Centre, Chandigarh. Having acclaimed experience of over 21 years, Dr. Arvind is a prominent gastroenterologist of North Region. Prior to joining Fortis Hospital, he was associated with Chandigarh Medical Centre as Senior Consultant, Gastroenterology. 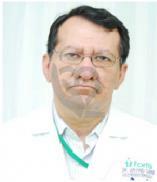 Besides, Dr. Sahni had worked in a Liver Transplant Unit in Birmingham, UK and numerous other hospitals in Ireland. After completing his MBBS from the renowned Christian Medical College, Ludhiana, he accomplished his post graduation in Paediatrics and super specialisation in Gastroenterology from the prestigious institute PGIMER, Chandigarh. Thereafter, he attained MRCP in the field of Gastroenterology from Edinburgh (UK). Dr. Sahni has gigantic experience of Liver Transplantation & Post Transplantation immunosuppression. He is also an expert in the treatment of perforation in a case of Jejunal Lymphoma, Esophageal Hematoma, as a complication of Anti-Platelet therapy & Imaging in Acute Pancreatitis. To his credits, Dr. Shani has bagged Gold Medal and has won many other distinctions in his field. Dr. Sahni is solicitous about research work in the field of Gastroenterology & his research work has been published in numerous national & international publications which he has also presented in various conferences. He was the Organising Chairperson of Fortis International Liver Summit 2012. Over and above, he is the elected member of Royal College of Physicians of the United Kingdom. He had been privileged to be the Guest Speaker for "The Institute of Hepatology--Foundation for Liver Research" in UK.